These are some of the comments we received from ninth-graders after our Healthy Relationships and Bullying Prevention presentations at Foothill High School and Amador High School in Pleasanton this semester. During the school year, I visit local middle schools and high schools to talk to teens about healthy relationships, teen dating violence and bullying in an age-appropriate way. At the end of each presentation, I hand out surveys to see how effective our presentations are and get anonymous feedback from the students. Recently we lost all federal and state funding for our youth education programs due to a cut in California funding. As a result, we’ve had to trim many of our presentations down from 2-day classes to 1-day condensed classes in Livermore and Dublin schools. Fortunately, the Pleasanton Youth Commission has continued to fund our Prevention Education program. Thanks to their generosity, we are able to continue providing 2-day presentations to health classes at Pleasanton schools. During our full 2-day presentations, we have the opportunity to do more activities with the students to talk about these topics. One of our most popular activities is called “What Would You Do?” During this activity, we read out different scenarios about dating violence or bullying. Then we ask students move to different corners of the room depending on whether they would do nothing (no intervention), step in on their own (primary intervention) or get help (secondary intervention). After each scenario, students get a chance to share what they might do. Wow, does this activity get teens talking! Whether we’re talking about dating violence or bullying, each student brings their own unique perspective into the conversation. Sometimes students disagree with their classmates’ suggestions for intervention; other times the entire class ends up standing in the same corner of the room. Many of the classes I visited at Foothill High and Amador High had a lot to say during this activity. In one class, I asked students what they might do if they witnessed a guy violently shove a girl to the ground on their way to class. Many of the guys in the class said they would step in and confront the guy. In contrast, several of the girls said they would feel more comfortable getting help from a trusted adult or friend. A few of these girls mentioned that they would be afraid of getting hurt if they tried to confront a male student. This sparked a discussion between the students about assumptions or expectations we might have about who can or cannot be a victim of violence. Many of the students have been encouraged to take a stand against bullying in the past. But often our presentations are the first time students have had the chance to discuss what intervening might actually entail. As presenters, we encourage students to think of intervening indirectly, such as asking for help from a teacher or friend, as well as being assertive. During the conversation, one of the guys mentioned that he would be worried about embarrassing the victim (another guy) if he told the abusive student to stop. So we discussed other ways he might intervene, such as getting help from a teacher so he didn’t have to directly intervene or checking in with the male student in private after the incident. Isn’t it amazing how one scenario can prompt so many different opinions? Many of the other classes had similar discussions about this particular scenario. As I tell the students, there is no “right” answer when we do this activity. There are many ways students can safely intervene when they see dating violence or bullying happen at their school. It’s just a matter of getting students to consider their options. 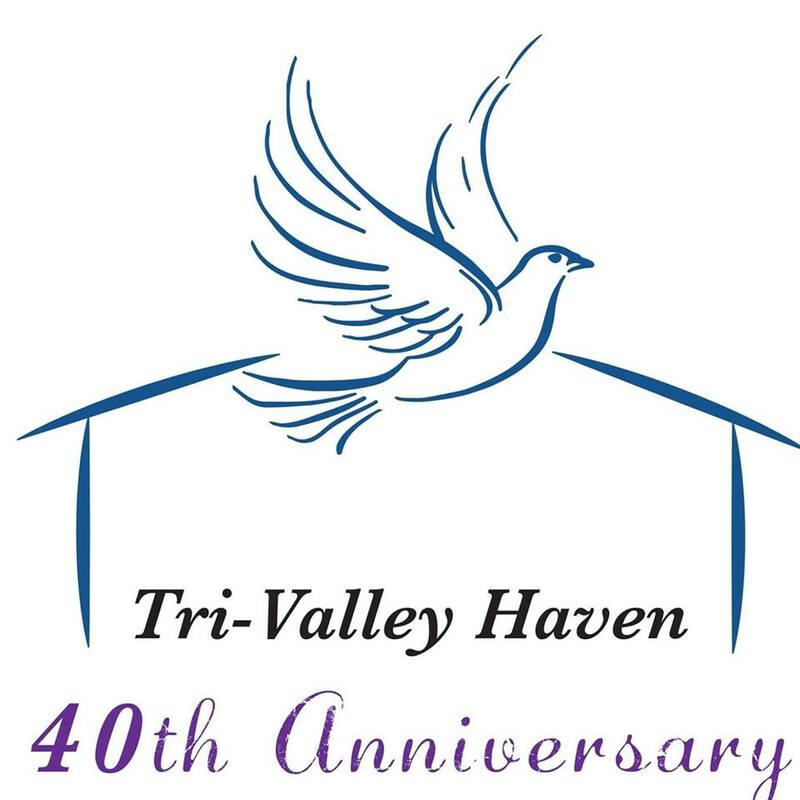 In addition to providing advocacy for survivors of sexual assault, Jessie is the newest presenter for our Prevention Education Program at Tri-Valley Haven. Learn more about our teen presentations our Teen page on our website. Shelby Henry is an advocate at Tri-Valley Haven, a passionate blogger, a dolphin rights activist, and an all-around amazing person! Yesterday I witnessed a man assaulting a woman, in broad daylight and on a busy street. When I drove by I only saw for maybe a second what was going on and I think that my brain tried to convince me it wasn’t what it looked like. They were probably messing around. It’s 11 AM, you would have to be insane to attack a woman in broad daylight on this busy street with all these cars driving by. I kept driving. I made it about two streets further before I finally decided it was worth at least turning around just to ease my mind and confirm that the woman was alright and nothing was going on. The woman was not alright and the man had in fact been attacking her. He was grabbing her by the hair as she tried unsuccessfully to swat him away. I turned my car in his direction and floored it. I screeched to a stop right before ramming into the sidewalk and started revving my engine at him, honking my horn, and screaming that the cops were on their way (he was probably really intimidated until he heard Etta James playing through my open car window…). The woman got away and took off, barefoot and in pajamas. The police arrived within just a couple of minutes and handled the situation. I was horrified to think that I had almost continued about my day without going back to verify what was going on. If you’ve taken a basic psychology or sociology class you’ve probably heard of a phenomenon called the bystander effect. Basically it is when bystanders witness a crime or emergency and do nothing, either out of fear or because they think someone else will call authorities. I think that five months ago, before my training with the Tri-Valley Haven, I would have kept driving. I would have convinced myself it was nothing and that I was just crazy. Sometimes I think people worry that they will report something incorrectly or that it won’t be worth the officer’s time to check something out. What we don’t realize is that the police are here to serve us and to protect us; it is their duty and it is what they get up everyday to do. I think that as citizens it should be our own duty to look out for each other and keep our towns as safe as possible. We have a responsibility to help police maintain city safety, as they are unable to be everywhere at all times. If you see something that catches your eye and it doesn’t seem right, call the non-emergency number in your city. Err on the side of caution, because it is always better to be safe than sorry. Something I have been thinking about when it comes to this blog is—what IS Bystander Intervention, really? Some of it is pretty obvious—stepping in to help a friend at a party when she is drunk and someone is clearly trying to take advantage of her. That’s bystander intervention. Hearing a friend of yours making sexist comments and telling him, “Dude, that’s not cool.” That’s bystander intervention. …can it be done online? Weirdly, even though I’m writing this blog, I hadn’t thought so much about ONLINE bystander intervention until I read a recent series of news stories. This story got me thinking about a whole bunch of things, actually—bystander intervention was one thing. But also how we can’t really limit ourselves to one social problem at a time. Things are all intertwined—that woman who is homeless might be homeless because of domestic violence. That man who has substance abuse issues might be trying to deal with the pain of childhood molestation. Someone suffering racial discrimination is being impacted by a culture that also perpetuates other kinds of discrimination and suffering. We are truly all connected in so many ways. This leads me to the story of Mallory Owens. There has been a lot on the news about this young woman, who went to the home of her girlfriend on Thanksgiving, where her girlfriend’s brother attacked and beat her so violently that she suffered brain bleeding and needed reconstructive surgery and two metal plates to restore her cheekbones. The young man, Travis Hawkins Jr., was charged initially with Second Degree Assault and was bailed out almost immediately. There has been debate as to whether this attack was prompted by Mallory being an out lesbian—whether Travis attacked her due to her sexuality and dating of his sister. 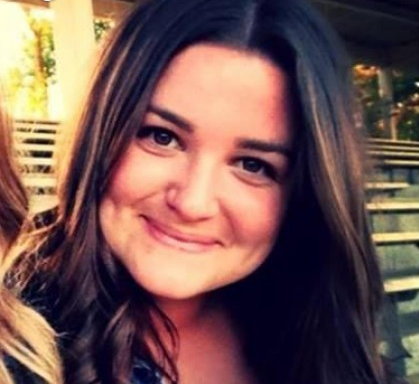 At first, Mallory’s family said emphatically that the attack WAS due to Mallory’s sexuality. It also came out that in a previous incident, Travis Jr. had attacked Mallory with a metal wrench and threatened to later “finish the job” he had started, and that Travis’ father several years prior had shot his own son in the stomach–and several years before THAT had discharged a firearm over the heads of his children in the bedroom. Clearly, there is a history of domestic violence in the family. And clearly, this was not the only time Travis Jr. had attacked Mallory. Mallory’s family and friends rallied around and tried to raise awareness of the relatively minor charge of Second Degree Assault. A Facebook Community called “Justice for Mallory Owens” was formed and now has over 15,000 Likes and over 23,000 people talking about posts made on the Community Page. Later, there was some confusion when Mallory—upon being released from the hospital—went to the home of her girlfriend and the Travis family for a press conference in which she said that she did NOT claim the attack as a hate crime. Then, not too many days later, she said that she had been tricked and intimidated into making the appearance at the Hawkins home, and maneuvered into a position where she had to make these statements. She then released a written statement saying she had been attacked due to her sexual orientation and that she was in continuing fear for her life. As you can tell by reading this—there are a LOT of issues going on here, ranging from domestic violence to hate crimes, gay-bashing, child abuse, and more. But what is at the heart of it—the core of it—is that a 23 year old woman had gone to the home of her girlfriend to celebrate Thanksgiving, and was left beaten nearly to death, desperately injured, traumatized and terrified. She faces high medical bills that her family is going to struggle to pay. Her life will never, EVER be the same. The hope of her and her family is that the charges will be upgraded to Attempted Murder. The likelihood that this was a hate-motivated crime seems extremely high. However, in Alabama, where the attack took place, there are no laws on the books that include attacks against gays and lesbians prompted by their sexual orientation as hate crimes. For these reasons and so many more, the future is uncertain for Mallory. She faces a long road of recovery ahead—physical, emotional, spiritual. Now… what does this have to do with a bystander blog? For one thing, according to reports, the girlfriend’s family did not intervene in the beating. They were passive bystanders. Why? Quite possibly out of fear. If this family has suffered child abuse and domestic violence in the way it clearly has, fear could quite easily paralyzed them. Right or wrong, they took no action. But it got me thinking about what might have happened if someone had intervened. Could they have done it safely? If so… how? These questions in and of themselves could make their own blog post. Or several. But I was talking about Bystander Intervention and the Internet. The INTERNET response to this tragedy really opened my eyes. Here, there are THOUSANDS of active bystanders—people responding to the Facebook Community. People posting in forums. People signing petitions urging the charges of 2nd Degree Assault to be upgraded. People sending money to help with Mallory’s medical expenses. Can you by an active bystander on the internet? YOU DARN WELL BET YOU CAN. And being an active bystander here can make a difference just as profound as being one in other venues. Like I said at the beginning of this post, we are ALL connected. You don’t have to be a woman to care about women’s issues. You don’t have to be an recovering addict to care about addiction issues or their connections to poverty and abuse. You don’t have to be a survivor of violence to know that violence in our homes and relationships is destructive, wrong, and pervasive. And you don’t have to be gay or lesbian to care about Mallory Owens. For the Justice for Mallory Owens Facebook Community, use this link. For the GLAAD fundraiser page to help pay for Mallory’s medical expenses, go here. For the Change.org petition to upgrade the charges against Mallory’s assailant to Attempted Murder, use this link. Step Up! Don’t Stand By! Rachel created this powerful image for our yearly t-shirt contest. Thank you, Rachel, for showing so directly the way words can injure! 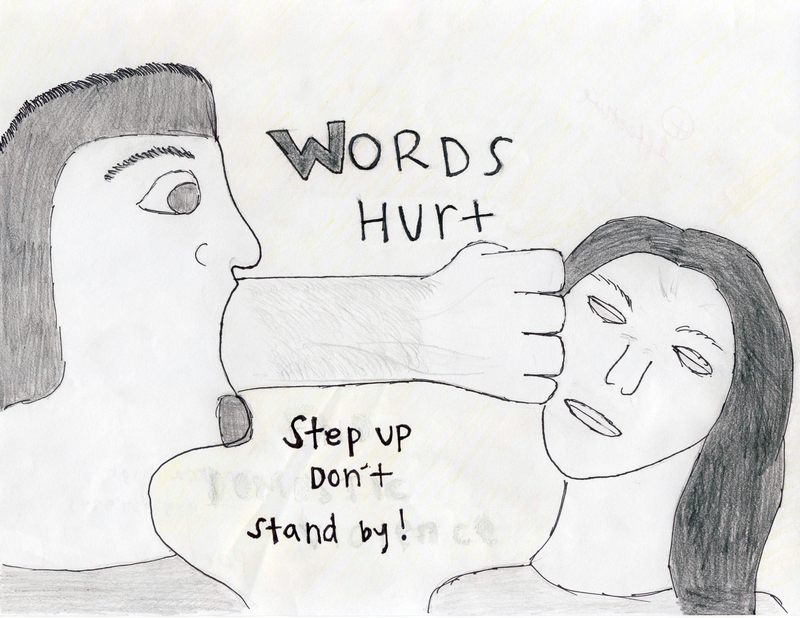 Bystanders are kids and teens who witness bullying and cyberbullying in action, who do and say nothing. Very often they don’t know what to do. They’re afraid of retaliation or fear that their own group will exclude them for helping an outsider. When you’re a bystander it’s important to know that by doing nothing you are sending a message to the bully that their behavior is acceptable. There is strength in numbers. Every school and every community has more caring kids than bullies.